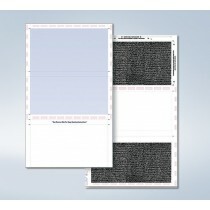 Pressure Seal continues to replace traditional envelope mailing systems, Pressure Seal eliminates labor cost of folding, stuffing and sealing. 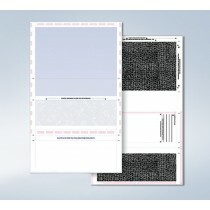 Pressure Seal checks saves you time and money when preparing a mailing, and eliminate the need to print a check / form and then stuff in to an envelope. 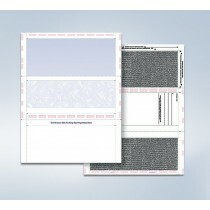 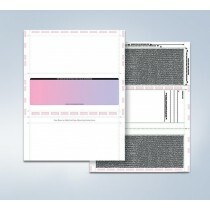 Most times, the final pressure seal document is what is sent in the mail, this is commonly seen with checks. Companies will send payroll checks or refund checks folded and sealed so the receiver has to tear off the perforated edges to access the information. 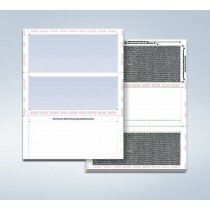 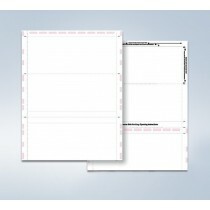 Standard check stock comes blank, with the check in the bottom, middle, or top position, and a variety of colors and security options. 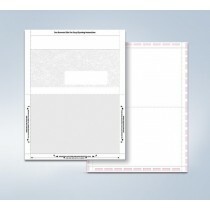 Pressure seal forms are securely folded and sealed when processed by a folder/sealer. Patterns of a pre-applied "cohesive" are aligned during the folding process and stick only to each other when high pressure is applied Pressure Seal Technology increases productivity, reduces processing time, cuts expenses, shrinks labor costs, and allows you to maximize postal discounts. 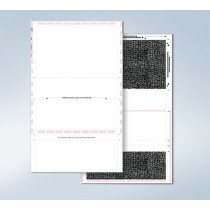 Pressure seal forms are then processed through a pressure folder sealer and emerge securely sealed and ready to mail.